← Olympia Students make the US World Epee Team! 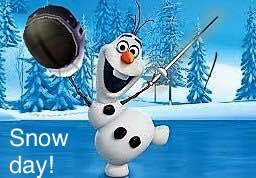 Due to inclement weather, Olympia Fencing Center will be closed tomorrow, Tuesday, March 13. All fencing classes and private lessons are canceled. We plan to reopen for regular schedule on Wednesday. This entry was posted in Club News and tagged club closed, nor'eastern, weather closure, winter storm. Bookmark the permalink.